Anthropologists tell us that primitive man evolved in part because of his abilities to still-hunt--moving silently and methodically in pursuit of big-game animals. Today, still-hunting is the least understood method of tagging trophy whitetail bucks. Still-Hunting Trophy Whitetails teaches hunters how to hone their woodsmanship skills to conquer the challenge of stalking bucks, with tips on camouflage and scent control, scrape lines, feeding and bedding areas, and travel routes. Details on yardage estimation, timing, shooting positions, and bowhunting thin cover provide the information necessary for successful "sneaking and peeking." Special techniques for calling during the peak of the rut and imitating doe-in-heat bleats, buck contact and tending grunts, fawn-in-distress bleats, and buck clicks and growls round out the book. Great book! Very knowledgeable on deer and their habits. Highly recommend for any deer hunter out there. Experienced and none experienced alike. 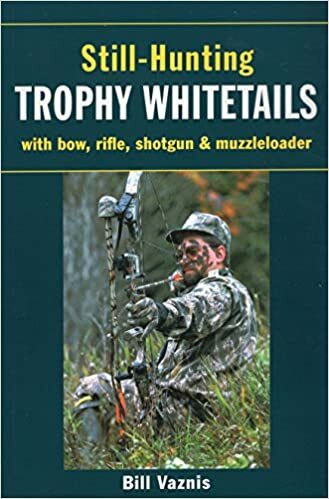 Being a older hunter I was surprised to find this book to be a wealth of new information. Since Teddy Roosevelt's day, outdoor writers haven't written much on the subject of still-hunting. In fact, it was way back in 1882 that Teddy's friend Theodore S. Van Dyke wrote "The Still-Hunter," which remains the classic work on the subject. Vaznis's new book on the topic will give a boost to this time-tested method because it shows up when most hunters are getting frustrated with stand hunting. If you're willing to get out of your stand and try a method that will make you a better woodsman, a better student of deer, and a more successful hunter, the book has arrived at the right time. I spent years hunting from stands before I gained confidence that I could become a good still-hunter. That confidence would have come much sooner if I had "Still-Hunting Trophy Whitetails" a long time ago. Now that I have it, I'm making a regular habit of studying its contents. My advice is that you do that same, because there will be a time when the art of still-hunting will rescue your season.